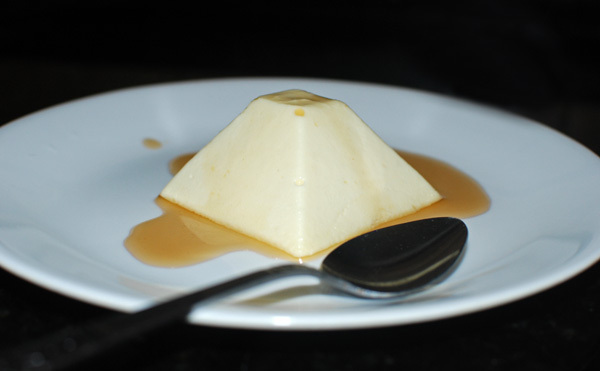 Paskha is a traditional dessert made of tvorog and shaped like a truncated pyramid. Culinary writer William Pokhlebkin notes that the cost of the dish used to mean that simple people could only afford it about once a year, and chose to time it for the end of the Lenten fast in the orthodox faith — in fact, the very name paskha comes from the name of Paskha, the Orthodox Easter! However, nowadays it is prepared at any time of the year regardless of the religious holidays. Paskhas can be raw, cooked like a custard, or baked. In addition to the tvorog, they can contain cream, butter, eggs, sugar, nuts and dried fruits. The raw ones rely on whipped cream to hold their shape, while the cooked ones use egg yolks. Anything not baked is shaped using a wooden mold called pasotchnitsa. I chose to make a baked paskha, similar to a very light cheesecake. I also prefer not to use nuts or fruits inside the paskha and instead add them later as elements that will complete the plated dessert. In order to keep the traditional shape but make individual portions, I am using a pyramid silicon mold: each pyramid measures 2.75″ length x 2.75″ width x 1.5″ high and contains 2.5 fl. oz. I found these beautiful flageolet beans at the Union Square Greenmarket in New York City last Saturday. Since they are typically available for a couple weeks at most, you have to act fast. I gathered a mix of seasonal vegetables to use as a soffrito, and added some tomato compote. Cooking the beans in a pressure cooker gives outstanding results. 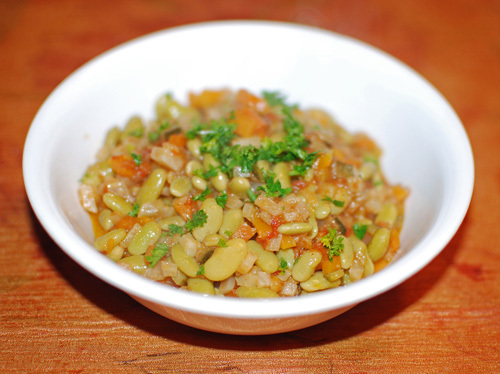 The beans become very tender without getting mushy, while the soffrito almost melts. The tomato compote recipe is adapted from Heston Blumenthal: In Search Of Perfection, a book that I highly recommend. I also got the idea for the pressure cooker from Blumenthal. Separate the cores, skins and seeds from the flesh of the tomatoes. Chop them, mix with the salt and transfer to a chinois placed over a bowl. Leave for 30 minutes and reserve the juice. Coarsely chop the tomato flesh and reserve. Heat the olive oil in a pot. Sweat the garlic and onion over medium heat until soft, for about 10 minutes. Stir in the coriander, star anise and allspice. Add the Tabasco sauce, Worcestershire sauce, tomato ketchup, red wine, and thyme sprigs together with the juice from the tomatoes and tomato flesh. Cook for 2 hours over low heat, so that the compote is lightly bubbling. Turn the heat to high and cook the compote for another 5 minutes, stirring constantly. Remove from the heat and let cool. Transfer to plastic containers and refrigerate. Remove the excess oil at the top when cold. Soak the flageolet beans in cold water for about 2 hours. Melt the butter in the pressure cooker over medium heat, add the celery root, carrot, and zucchini, and cook until soft. Add the tomato compote and the beans and season with salt and pepper. 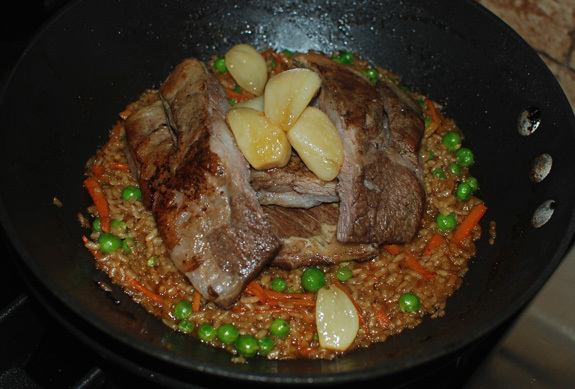 Close the pressure cooker, heat until the pressure builds up, and cook for 20 minutes. Let rest for 5 minutes, then release the pressure. Sprinkle with parsley and serve.